Ring News 24Boxing NewsWill we see another boxing mega-fight in 2018? The bout between Floyd Mayweather and Conor McGregor in August generated a lot of coverage before, during, and after the fighters took to the ring. Strong opinions dominated the boxing press and column inches were made beyond the sports sections of the newspaper, as two sportsmen with big reputations and bigger mouths faced off against one another. 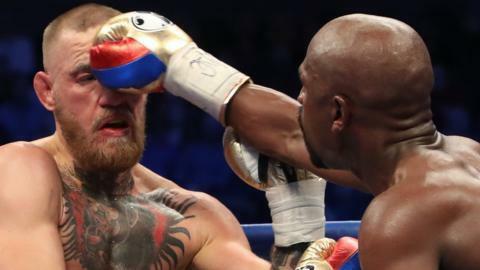 In the end, Mayweather stopped his boxing novice opponent in the tenth round, but McGregor emerged with a lot of credit for his technique and durability. It has now emerged that the fight — unlikely to go down as a ring classic — was one of the most lucrative boxing matches of all time, raking in more than $600million in ticket sales, pay-per-view buys, and sponsorship payments. Mayweather may have announced his definitive retirement from the ring at the end of the fight, while UFC owner Dana White insists that McGregor — his most lucrative asset — will not don the gloves again. However, given the money and the publicity generated by the fight, what do the numbers suggest for boxing in 2018? Heavyweight puncher Tyson Fury has made more column inches in recent years for what he says outside the ring than what he does inside it. An undoubtedly talented boxer, Fury’s reluctance to shut his mouth emerged again recently when he rapped — yes, you read that right — a stern rebuke to the sport’s authorities and promoter Eddie Hearn after accepting a backdated two-year ban from boxing. Fury intends to return to the ring in 2018, and has called out Anthony Joshua as the man he wishes to fight. Many in the sport feel that Fury needs to stay out of the ring given his propensity for emotional outbursts and problems with recreational drugs. If he gets his boxing license — suspended for medical reasons — back, however, any fight involving him is likely to draw cash. Everyone stands to benefit: promoters will be keen to make it happen, it would keep the likes of GamblingKingz.co.uk busy finding the best odds on the fighters, and it’d mean a big payday for both involved in the bout. Big fights like this are where the money is, perhaps helping to ensure Fury’s return to the ring sooner rather than later. How retired is retired, exactly? Floyd Mayweather’s career stats make for some impressive reading. 50 fights, 50 wins (27 by KO,) five separate weight divisions, three retirements. He says the McGregor fight was his last ever, but when you’ve come out of retirement twice already, people are always liable to question how much you mean it. After his fight with Manny Pacquiao in 2015, rumours swirled about a rematch which has not yet happened, so there is unfinished business there. McGregor, for his part, has not explicitly said he will not return to the boxing ring, no matter what Dana White says, and suggestions have been put out that the Irishman might get in the ring again to face Pacquiao– rumours not dampened by the Filipino’s suggestion that talks over a 2018 match have already taken place. Although “The Notorious” has said he intends his next fight to be in the UFC octagon, no-one would be surprised if he chose to take on another huge boxing payday. If Pacquiao were to win that — and beat McGregor more impressively than Mayweather did — would that persuade “Money” to unretire for a third time and fight Pacquiao once more? The one thing for sure is that this is boxing we’re talking about, and when boxing money men get to talking, you can rule nothing out.